My phone died on Saturday. There I was, at my son Jake’s baseball game, just clicking around on Pinterest and the screen went blank. There was no beeping sound, no flash of the screen, no warnings. Just nothing. The smell of the last pin was still in the air. I tried five times to reboot the phone by removing the battery but it just looked back at me with that blank stare. I knew it was a technical error beyond my control. While I am notoriously clumsy and have broken another phone in the past, this time it wasn’t operator error. I got my current phone less than a year ago. I’ve done everything from buying a protective case to making sure the phone is in my bag and not my pocket to keep it safe and in one piece. So there I was sitting at the game surrounded by parents, kids on the field and kids in the stands. Crap, now what? It was weird how calm I was because I knew this was beyond my capabilities to be fixed. After the game, I went to the Verizon store to see what they could do. They pushed buttons, replaced the battery and even called some 1-800 tech support number. Nothing. The words ‘order a replacement phone’ was the answer. Still I was strangely calm. Ok, let’s just go with it and I went through the process of getting a replacement phone sent to me by overnight mail. But overnight mail only means BUSINESS days and it was Saturday. I wasn’t going to get my new phone until Tuesday. Discussions were held about activating an old phone and instructions were given. I knew I had two old phones at home and I could at least have phone service again. We wrapped up all the paperwork and the Verizon lady says to me, “What’s the best number to reach you at?” Seriously? Did you just ask me that? Now I’m cracking jokes. Still feeling oddly calm. I couldn’t my old Blackberry to power up so I tried the really really old one. I got that one to work but it had a low battery message and the charger was gone. When I cleaned out my office closet, I threw out all my old chargers and cords. Crap, now what? I checked with my neighbor and even tried Walgreen’s. Nothing to help me charge the battery for the old phone. 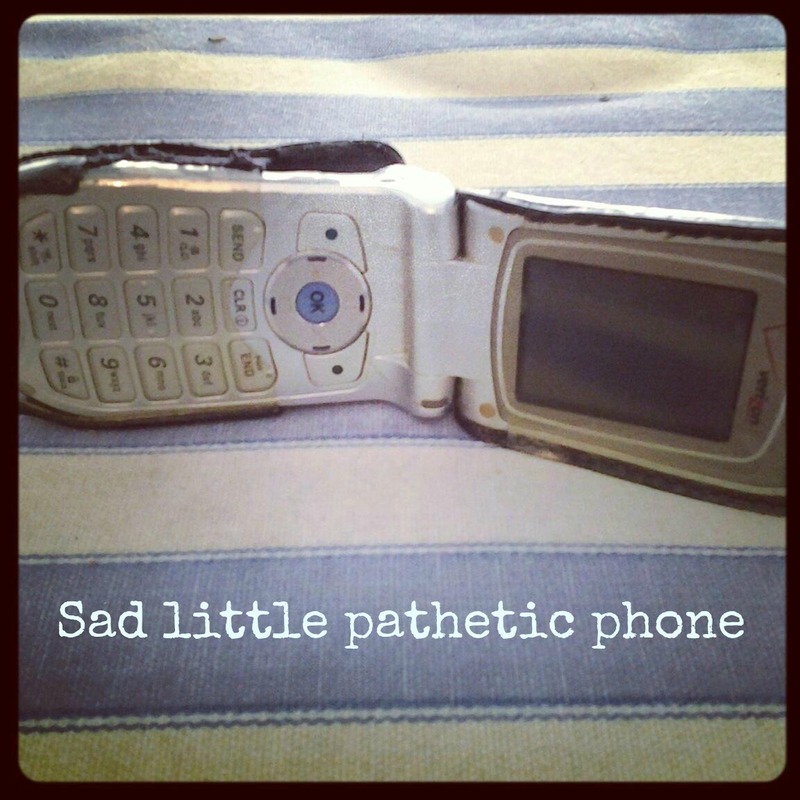 It was a sad little pathetic phone. By 9:30pm, the sad little pathetic phone shut down. It gave me one last warning to charge the battery, flashed at me three times and powered down singing that old familiar tingling song. And now I don’t have phone service. But you know what? I didn’t do what everyone thinks I’m gonna do. I didn’t freak out. I felt disconnected. Not a disconnection because no one could reach me with a call or text. I felt disconnected from the phone itself. The house seemed eerily quiet. No phone calls, no texts, no emails, no funny notification noises if someone posted something on my Facebook page. Nothing. I admit it – I’ve turned into one of those people who check my email on my phone before I even get out of bed. I check the weather before I get dressed. I read Facebook or click through Pinterest when I’m waiting in the carline to pick up Jake. And here I was with this …. this phone thing and it wasn’t even working. I wish I could say that this experience happened because it was one of those life lesson moments reminding my to unplug but that’s not true. I wasn’t completely unplugged. My neighbor offered to let me use her phone if I had to call someone plus I had my computer and the new tablet. I couldn’t shut off the world. I have a business to run, clients to work for and a my son to take care of. I don’t have the luxury to turn off the phone and disappear for awhile. Don’t sweat the small stuff in life … and its all small stuff. I got a smart phone about a 1 1/2 years ago. I wasn’t sure how much I would use it. Iswore I would not be one of those people that falls asleep with it on their lap while on the bus. No, that is what you do with a child. Fast forward and I am way to into the phone. I’ll spare you the details. However, I do love shutting it off and freeing myself on the Sabbath. it sounds liek you got this break – even if it wasn’t planned. It’s strange how much we’ve all grown to feel connected with our phones. Sometimes I see people at meetings look at their phones and I want to say, no one called you, stop looking at your phone. Good for you. Now, you have to impose a break. Show the phone whose boss. You need serious help. They are going to have to pry some gadget out of your hands when you go cold. I know that is harsh, but I say it because I care. Good for you. Nine to go. You’re on FIRE today! Must be too much sponge bob on the brain. I made that image in my Instagram account and one my friends commented to say, I didn’t think they made those phone anymore. LOL I am like that! I had a nextel for like 100 years!! I’m sure the company HATED ME LOL!! !